NextA history of the First World War: No.4 Austria bombs Belgrade and all hell breaks loose. Mythology often dates back to antiquity. That is where my head is often buried, in a book about ancient Rome or Greece. In antiquity, we can find many of the best myths. They are usually about gods, supernatural heroes (often associated with the paranormal) and humans. Some of my favourite myths are associated with creation stories, like my article on The Churning of the Ocean of Milk and legends or folklore, like my recent outing about Roman god’s Pomona and Vertumnus. Today, I will focus on another one of my favourite legends ‘The Chimera’. In one of my favourite epic Greek poems, The Illiad, Homer briefly describes the Chimera as an immortal creature, made up of three animal parts, a lion with a snake tail and a grotesque goat as its middle. In Greek mythology, I have also read about a variation of this creature that has a dragon at its hind. In Ligozzi’s drawing, you can see the dragon at the rear, breathing out what appears to be fire or a tongue of flames. In both, Homer’s description and Ligozzi’s drawing, the Chimera is a female fire-breathing monster. According to legend, the Chimera was the daughter of two horrible monsters called Typhon and Echidna. She wreaked havoc in Lycia and its surrounding region and was associated with destruction, in particular, storms, shipwrecks and natural disasters. Eventually though, legends states that she was killed by a Greek hero, called Bellerophon, with the aid of the winged horse Pegasus. Greek hero Bellerophon depicted killing the Chimera on this Attic red-figure epinetron (pottery) 425-420 BC. The Chimera is depicted in many ancient works of art such as mosaics, pottery and plates. However, by the end of the seven century depictions of the Chimera in medieval art changed. She was apparently largely forgotten as the three-headed beast from ancient times and came to be represented with more human characteristic. Jacopo Ligozzi’s ‘La Chimera’ is arguably a rare depiction of the Chimera in her ancient form. What is amazing about the Chimera by Ligozzi is that it is a miniature of only some 32 x42cm. Interestingly, many artists like Ligozzi would draw their subjects first before eventually painting them. However, on this occasion Ligozzi chose not to paint his subject and I suspect we will never know why. However, the sheer detail of the drawing itself is still quite striking. Just look at the detailed of the lion’s mane is or how the webbed claws of the dragon appears to grips the ground. Ligozzi has truly done justice in capturing the intrinsic nature of this mythical monster. Photo Credit The header image of “The Chimera” 1590-1610 is by Italian master Jacopo Ligozzi. It is from the Museo Nacional del Prado, Madrid, part of the Spanish Royal collection. 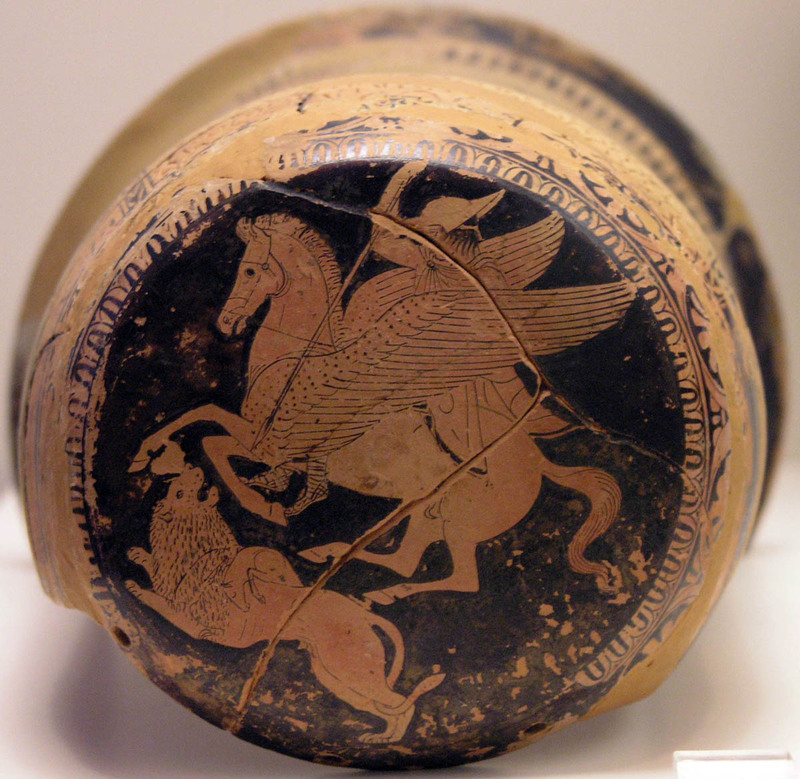 The Bellerophon ‘pottery’ image is used under the creative commons Attribution-Share Alike 2.5 license. So this is the origin of the word Echidna. A history of the First World War: No.4 Austria bombs Belgrade and all hell breaks loose.